In honor of the Winter Olympics now in Canada, we get to see a Canadian fossil image. 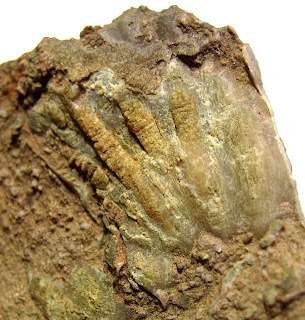 This crinoid calyx image was sent to me by Paul Racicot who has a blog at paulracicot.blogspot.com. Do not fret if you cannot read French as translate.google.com can help you with automatic translation (go to the Google site and enter the website address and choose the translation type). 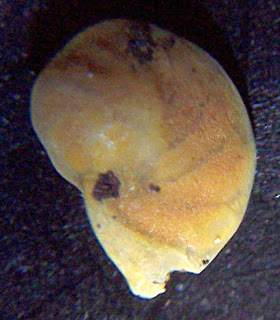 This calyx about 1 cm wide was found in L'Anse-McInnis, Gaspesia, Province of Quebec. Not sure the exact time period but it appears to be either Devonian or Silurian. Always good to find a crinoid calyx! Thanks for the image Paul. 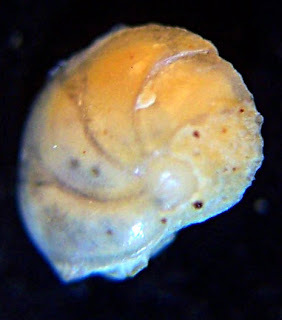 This fossil is called Lenticulina sp. found in the Sternberger Kuchen of Kobrow, Germany. The small creature existed in the Paleogene Period (about 65-23 million years ago). 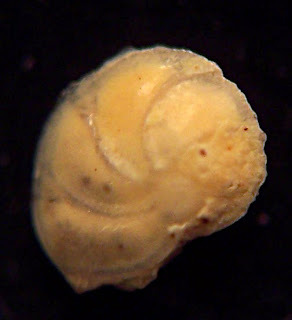 Thanks to Michael Hesemann and his treasure trove of information about foraminifera at the website: www.foraminifera.eu. Specimen photographed with an Orion Microxplore microscope set at 40x using a Kodak Easyshare LS743 camera.